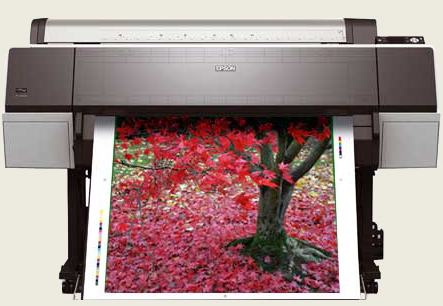 Representing Epson's next generation, the Stylus Pro 9900 (44"), 7900 (24") printers incorporate the latest achievements in photographic ink jet technology. By combining the precision of our MicroPiezo TFP™ print head with the extraordinary performance of Epson UltraChrome© HDR ink. Epson UltraChrome HDR represents their latest generation of pigment ink technology. Now utilizing ten colors - including an all-new Orange and Green - Epson UltraChrome HDR ink produces the widest color gamut ever from an Epson Stylus Pro printer. Even more remarkable, combining Epson UltraChrome HDR ink with their new Epson AccuPhoto™ HDR screening technology dramatically raises the level of print quality and sets the benchmark for photographic reproduction. Please contact us for more information about our printing services.